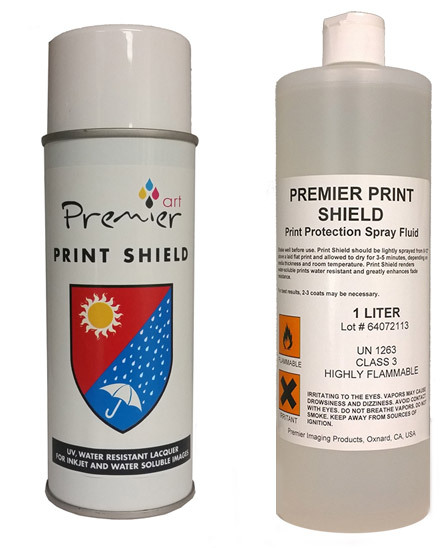 PremierArt™ Print Shield Spray is a lacquer based protective coating for all inkjet prints. Its low solids formulation maintains the original look of the surface of the print and eliminates gloss differential common with pigmented inks. Perfect for any fine art ink jet print that needs protection. Also works great with RC photo papers. Low solids formula keeps original paper look and feel! Print Shield is available in aerosol cans for easy application and bulk 1 liter bottles for high volume HVLP guns. FACT: Print Shield will extend the life of your prints! FACT: Print Shield is recommended by Epson for protecting inkjet prints.